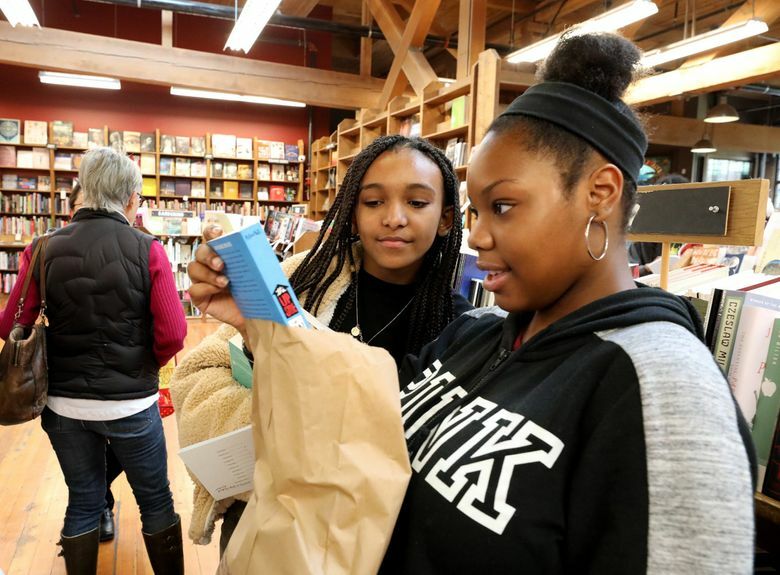 Roughly a hundred Garfield High students came to Elliott Bay Book Co. this week to buy whatever books they wanted, each equipped with a gift card and a store discount. It was the brainchild of English teacher Adam Gish, who believes in the transformative power of reading. It was, perhaps, the sound of worlds opening. 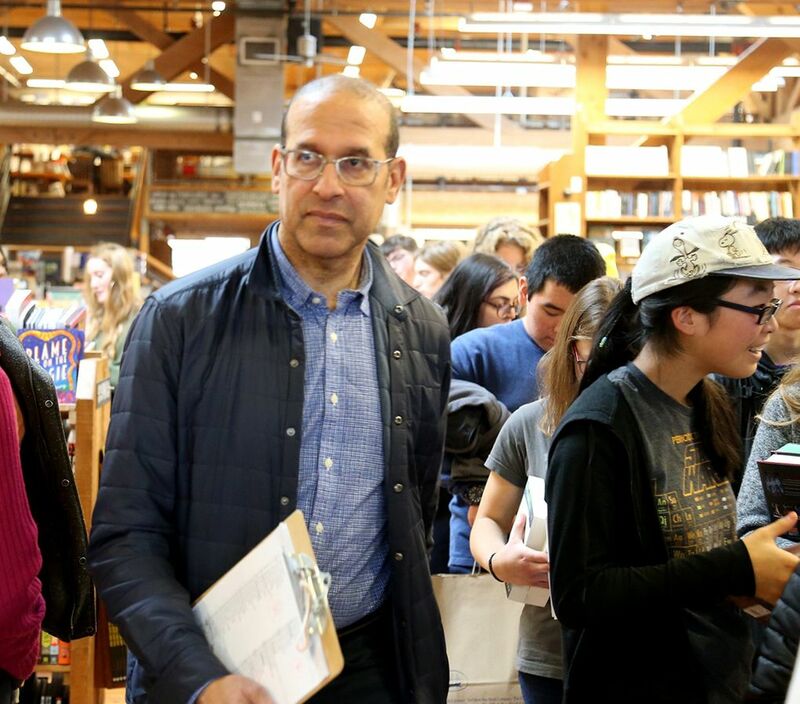 Roughly a hundred students from Garfield High School came to Elliott Bay Book Co. on Tuesday morning, bringing with them an energy that changed the store’s quiet air. Arriving in two yellow school buses, they streamed into the bookstore, laughing and talking and sometimes hopping and skipping with excitement. 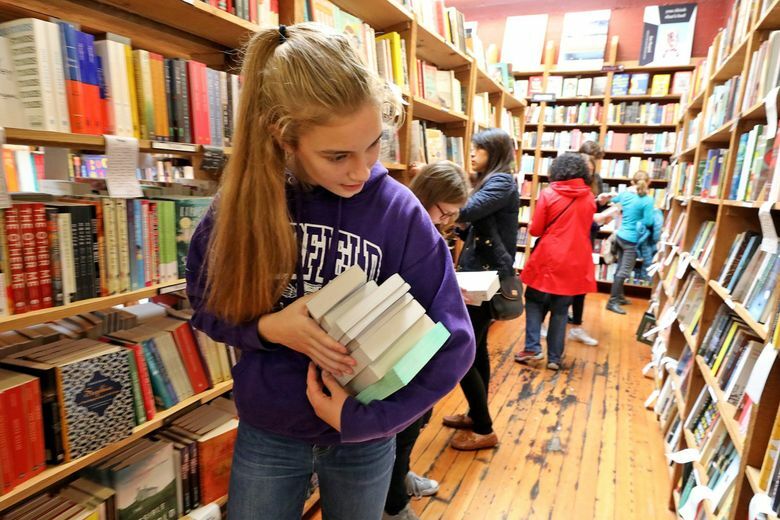 It was a school field trip, but one with a difference: They were there to buy books — whatever books they wanted. 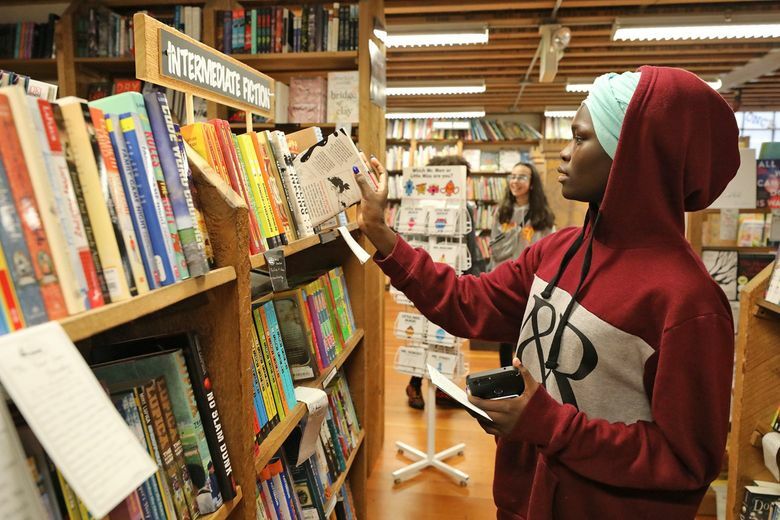 Each student was equipped with a $50 gift card, to which the store added a 20 percent discount. Years ago, he began asking his students if they’d ever been to a bookstore. Many hadn’t, so he would occasionally take a lucky few on shopping trips to Elliott Bay, buying each a book or two. It wasn’t something he could afford to do on his own very often, but the trips clearly meant a lot to the students. So he started thinking a little bigger — and, with funding from an anonymous private donor and from University Village, the program grew. “I talked to the ninth-grade teachers and asked them to select kids they thought would really want to go, and then I gradually opened it up to a larger number,” Gish said. 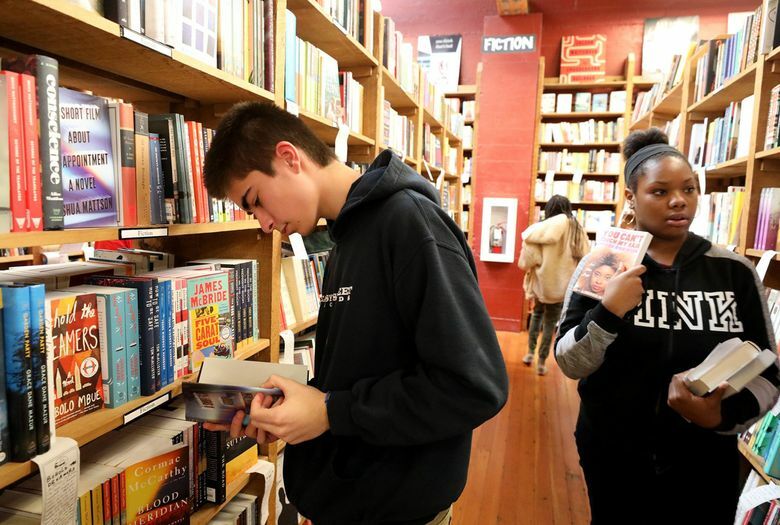 The students, ninth- to 11th-graders, needed to apply by writing Gish a letter, saying why they wanted to go to the bookstore. In the end, Gish allowed every student who wrote a letter to participate — though there were a couple who, after submitting only a sentence or two, were told they needed to try harder (and did). 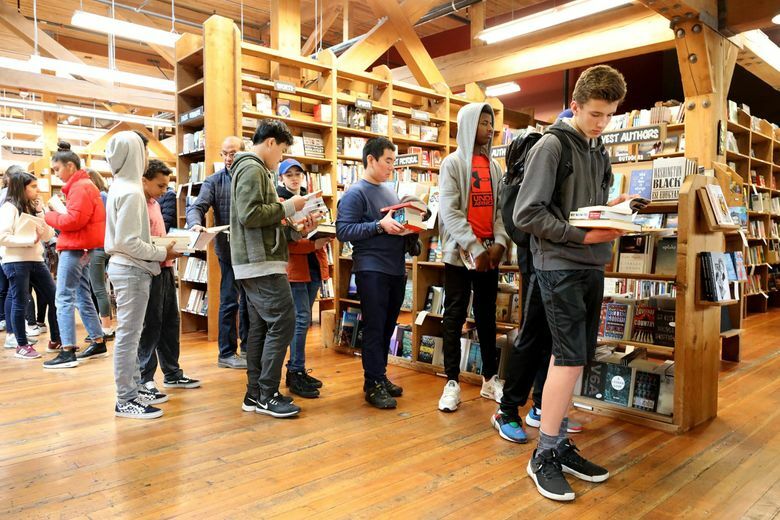 After some quick instruction on the sidewalk outside Elliott Bay — “Let’s have fun,” said Gish, telling the students to put away their earbuds and phones — the visitors were given book recommendations by Elliott Bay staffers and a tour of the store, then were free to browse and shop. 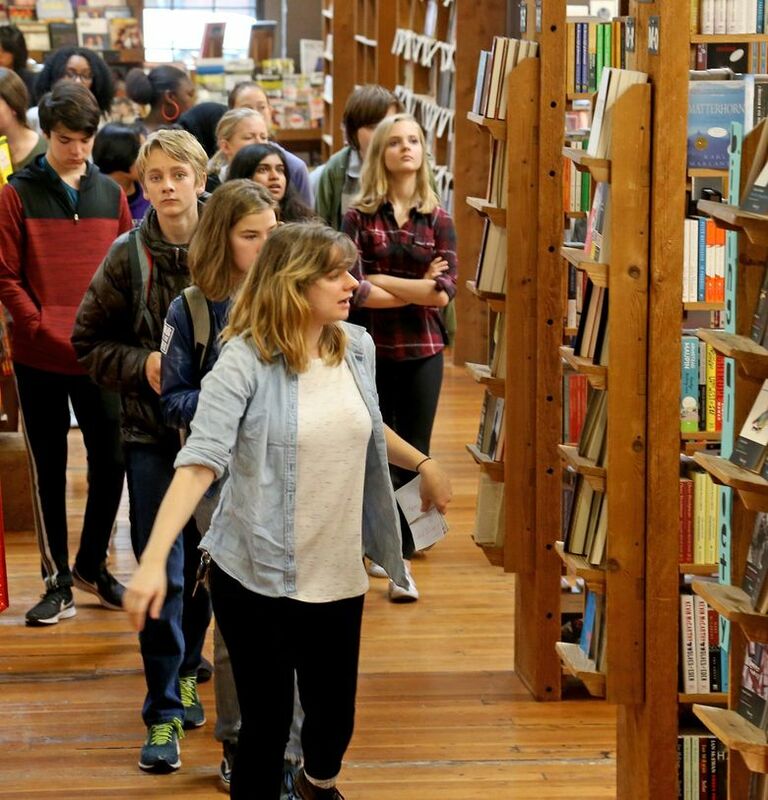 The YA and graphic novel sections were briefly mobbed, but quickly the students spread themselves across the store’s two levels, gathering piles of books. And what did they choose? 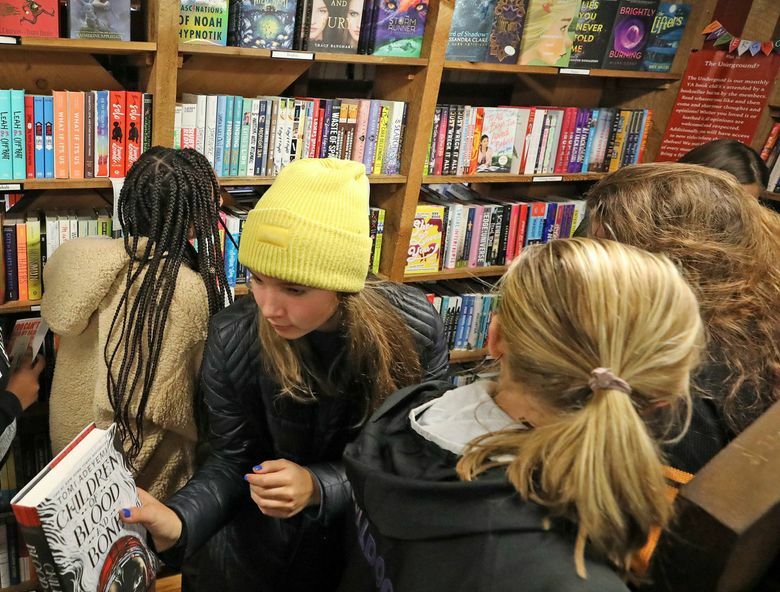 Angie Thomas’s YA novel “The Hate U Give,” about a black high-school student who witnesses a police shooting, was the most in-demand title; Elliott Bay general manager Tracy Taylor said that every copy in the store flew from the shelves. Also spotted in laden arms: “Baseball Americana: Treasures from the Library of Congress,” the poetry collection “Black Girl Magic,” Jenny Han’s “To All the Boys I’ve Loved Before,” Markus Zusak’s “Bridge of Clay,” Michelle Obama’s new memoir “Becoming,” a biography of the artist Vincent Van Gogh, Haruki Murakami’s “The Wind-Up Bird Chronicle,” Rainbow Rowell’s “Carry On” (“It’s like ‘Harry Potter,’” explained a girl, “but better.”), and many, many more. About 450 books were purchased, each speaking to its new owner in some way; each bringing, as books do, a new world. 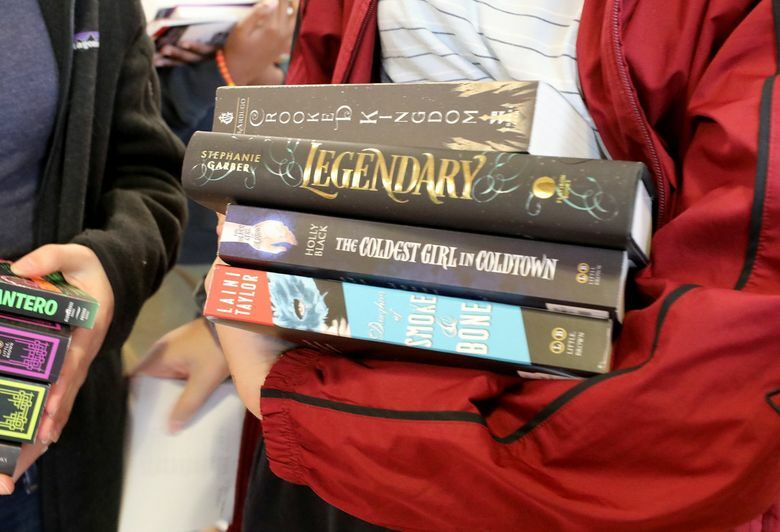 And as the buzz in the store grew, with students excitedly showing off their choices and recommending titles to friends, it seemed almost like the steady noise of a construction site — the sound of building something new and lasting, book by book, reader by reader.